Tournaire lined up for Narbonne before embarking on an illustrious career which included stints with Toulouse, Leicester Tigers and Perpignan. Tournaire formed a formidable partnership with Christian Califano and took full advantage of the change transition from amateur rugby to professionalism. Tournaire lined up for Narbonne for two years between 1995 and 1997 before making the transition to Toulouse - a controversial decision at the time as the transfer was announced just before Narbonne's clash with Tournaire's new side. From 1997 to 2002 he played for Toulouse before becoming the first French player to line up in the Premiership when he signed for Leicester Tigers. 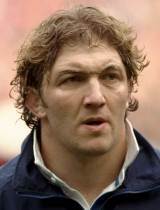 He stayed at Welford Road until 2003 when he joined Perpignan on a one year deal. After spending his year with the French premier side, he returned to Narbonne and spent a further three years there. However, he had a high profile dispute with Christian Labit and the two players were dismissed. In 2007, Lamaire signed for Racing Metro along with Agustin Pichot and finished his playing career following their promotion to the Top 14 in 2008. On the international scene Tournaire was a formidable figure in the French front-row and earned his debut against Italy in October 1995. He was a key part of the France side which took two Grand Slams in 1997 and 1998 and played in the World Cup final in 1999. After the 1999 showpiece, Tournaire played another year for the national side before losing his place to Pieter de Villiers under the new regime of Bernard Laporte. His last Test for France came against Australia in November 2000.